My rainbow walls were a spur of the moment creation. I had some old acrylic craft paints taking up too much room on a shelf, the urge to create and very little canvas to spare. So, I turned up the Hendrix song playing on the radio (appropriately enough, Bold As Love), gathered my courage, loaded my brush and flung it onto the wall before I had time to think better of it. It was going to be a disaster, I was sure of it, but soon I was having too much fun to care. By the time I finally ran out of paint and energy I was already in love with the beautiful mess I had created. After that, whenever I had a little extra paint on my brush or palette I would offer it to the rainbow walls. 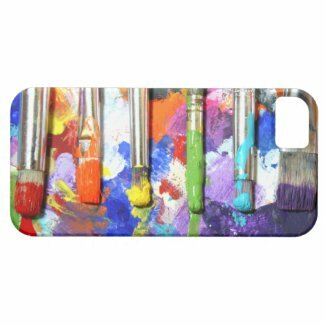 They became an ever evolving part of my world, a portal to optimism and a constant reminder of the power and joy of color. Unfortunately they were also inextricably linked to something that was alternately a blessing and a curse in my life: my oversized, overstuffed, impractical and impossible (no matter how many times I reorganized it) craft closet. One evening not so long ago I was having trouble getting that closet's door to latch when the thought occurred to me that I really didn't need the door at all. 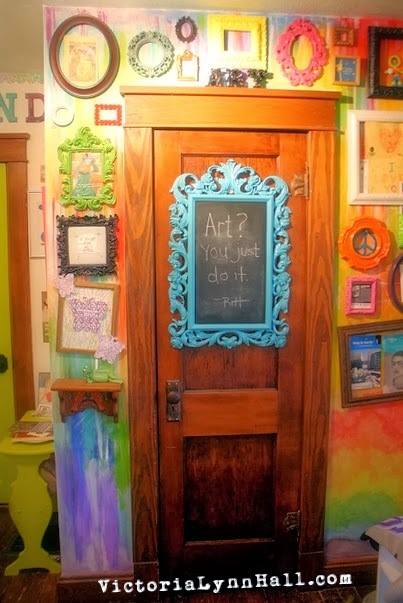 Without the door I wouldn't be tempted to just shove anything I wasn't sure what to do with into my craft closet. Without the door I could see all of my supplies and want to keep them organized. And if I didn't need the door, then I didn't need the walls either. That's when my muse appeared and a vision started to form in my mind and a lot sooner than later I found myself standing before my beloved rainbow walls with a sledgehammer in my hand. I thought I would miss my rainbow walls when they were gone but I don't really. This is partly because I am excited by the space and possibilities that have taken their place but also because the rainbow walls aren't really gone. They were really just a mirror of things that live within me: a spirit of spontaneity, a love of color, an undeniable impulse to create, a willingness to make mistakes and the absolute necessity of looking on the bright side of life. I don't think I need the walls to remind me of those things anymore. Besides, I can always create more rainbows. It's kind of what I do. Note: This was my #2 of my Top Ten Posts of 2014. 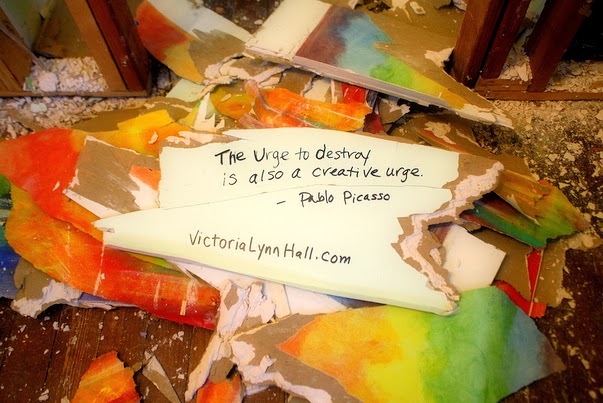 Click here to read more about the destruction of the rainbow walls. 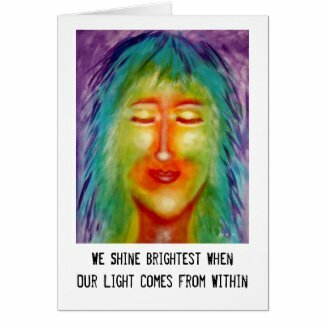 I love how you can always enjoy your "inner rainbow," Victoria! 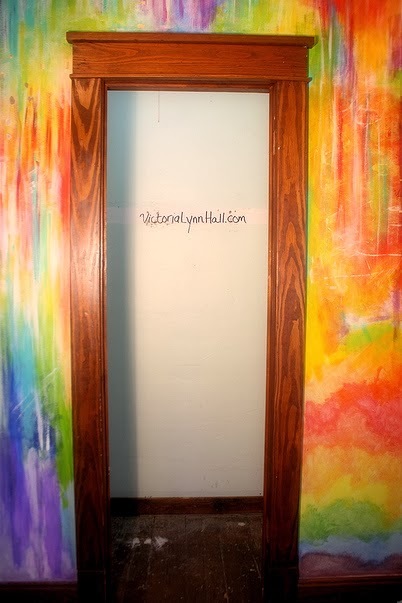 It shines through in your artwork, and fond memories of your rainbow wall will surely continue to inspire you.